The Huffington Post has long been known as a liberal blog, but they have been trying to rebrand themselves as a legitimate news organization, calling themselves “The Internet Newspaper”. That effort isn’t going too well, and a stunt they pulled today showed that they are still a liberal rag who will smear conservatives to fit their political agenda. Today they hosted an event in Tampa with several personalities. The program was about the nation’s job crisis, and Governor Kasich was on the panel. The governor made a comment that we need to promote entrepreneurship to the inner cities to inspire more black Americans. 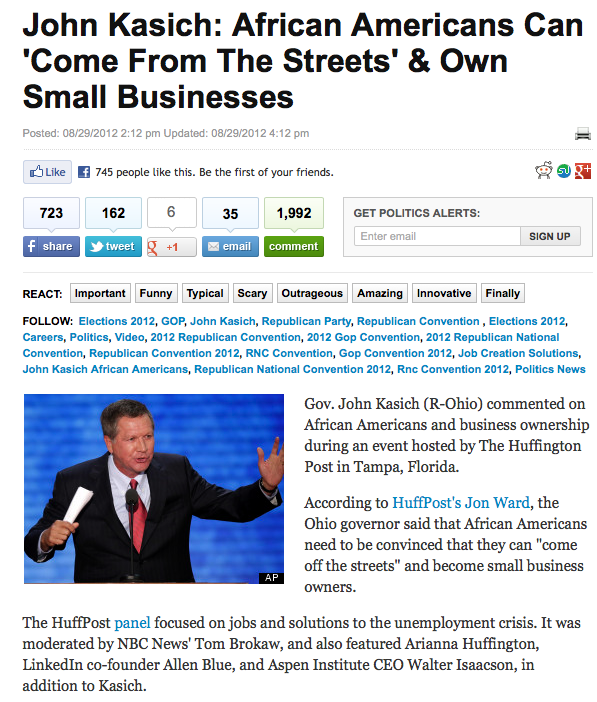 Unfortunately, HuffPo completely misquoted Kasich and made his comment sound racist. Here is what they reported, followed by a screenshot of their article. 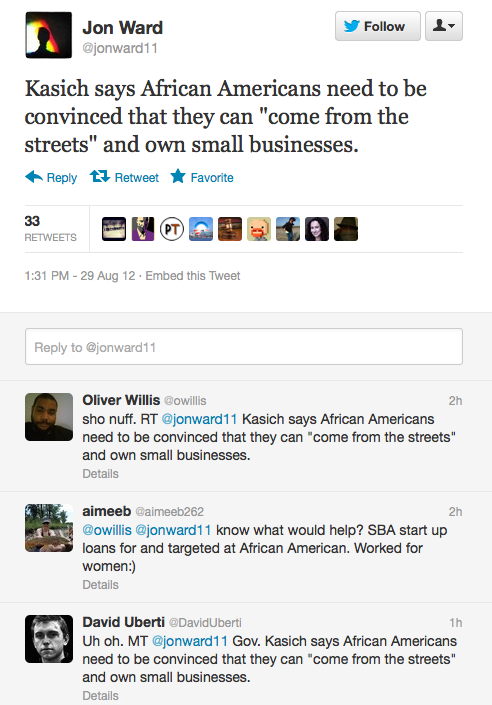 According to HuffPost’s Jon Ward, the Ohio governor said that African Americans need to be convinced that they can “come off the streets” and become small business owners. A real journalist, Joe Vardon from the Columbus Dispatch, later posted an article with the truth about what Kasich actually said. To illustrate his point, Kasich said he recently read an article about rap mogul, actor, and businessman Jay-Z, who is a minority owner of the NBA’s Brooklyn Nets. Jay-Z, born Shawn Carter, grew up in the Brooklyn projects and his early life struggles are well known. Kasich was clearly speaking about Carter in this context. This was a clear a deliberate smear by the Huffington Post. Someone over there got wise and they have since changed their article. That makes it clear that they knew they were guilty of false reporting and went back to fix it. Jon Ward, the reporter referenced in the article, also tweeted the smear, which was then retweeted by dozens of followers. I have included a screenshot of that as well. If The Huffington Post had any credibility, they would issue a retraction and an apology to the Ohio governor’s office. Many Republicans already avoid “news” outlets like HuffPost and I’m sure you won’t see John Kasich sitting down with them again anytime soon. If more Republicans start rejecting their invitations, they have only themselves to blame.